Offers: Various discounts including Juniors, after 2pm tee times and for locals. Modern Club house, with bar, full catering, Pro shop with equipment hire, and sales, superb practise facilities with all aspects of golf game catered for. 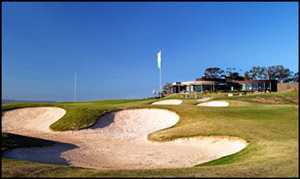 The Growling Frog Golf Course is a public course owned and operated by the City of Whittlesea in Melbourne’s northern suburbs. The Growling Frog is nestled amongst stately 300 year old River Red Gum trees on more than 250 acres. Surrounded by abundant wildlife, it is peaceful and picturesque with uninterrupted views to the magnificent Great Dividing Range. "One of the first and lasting impressions on arrival at the Growling Golf Course is the magnificence of the site and the serenity of the setting," says Graham Marsh. “This is a classic piece of land that truly reflects the unique beauty and character of the Australian countryside." The club prides itself on its friendly nature. Visitors are always welcome (contact club to make arrangements).